As part of "on-call" seismic analysis and retrofit services, Mr. Tamannaie served as Project Manager for seismic retrofit strategy for 65 structures and preparation of PS&E for upgrading of 54 of them with a construction cost of nearly $60 million. Projects included the multilevel 280/87 interchange in San Jose, various highway structures, railroad underpasses, pedestrian structures and a steel lift bridge over Napa River. Mr. Tamannaie's team prepared innovative, unique, and cost-effective solutions with minimal traffic and environmental impacts. Solutions included internal and external structural modification, "superbents," bridge foundation and abutment strengthening, soil improvement, restrainers, bearing modification and "catcher seats." Environmentally sensitive water crossings included the Napa River Bridge, the Bridge Across Napa River, Santa Ana River Bridge, Warm Creek Bridge, Guadalupe River Bridge, San Gabriel River Bridge, and the Bridge Across San Gabriel River. In the case of the 280/87 Interchange, the design was modified during construction using the newly developed push-over analysis, resulting in large savings. Mr. Tamannaie served as the Project Manager for the County's On-call Bridge Seismic Retrofit Program, funded through the HBRR program. The firm was assigned three bridges, all crossing over important waterways. The No-Collapse criteria was applied in determining the seismic retrofit of the structures. Innovative retrofit strategies and design alternatives were selected in such a way that environmental and right-of-way impacts were eliminated or minimized. 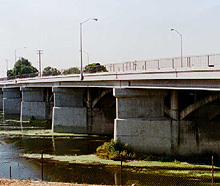 Soto Street over Los Angeles River: A six-span arch bridge constructed in 1928 and supported on large, unreinforced pier walls and timber piles. It was retrofitted by strengthening the arch rib ends, placement of transverse and longitudinal web walls between the spandrel columns on the ribs, tying of the original and widening pier walls together, addition of shear keys and foundation enlargement. 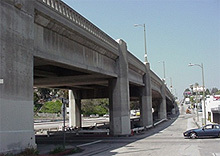 Westminster Avenue over Haynes Steam Plant Channel: A four-span precast, prestressed girder structure constructed in 1964 and supported on pile extension bents. The bridge was retrofitted by tying the superstructure spans together at each bent, load transfer to the abutments and providing additional seismic resistance at the abutments through anchor slabs attached to large diameter pile shafts. 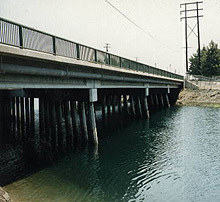 Second Street Bridge over Alamitos Bay: A seven-span, cast-in-place, concrete T-beam structure built in 1966. 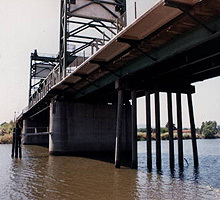 Retrofit design was developed to tie the superstructure spans together at each bent, transfer the load to the abutments and provide additional seismic resistance at the abutments through a strutting frame and a cluster of large diameter pile shafts at each abutment corner. The project presented the challenge of the presence of a large pump station at one end of the bridge and assuring its integrity during the seismic movements of the bridge. Mr. Tamannaie served as the firm’s first Project Manager for Bridge Seismic Retrofit and Rehabilitation projects for the City. The focus of his initial involvement with the City was programming as many as 83 bridges for retrofit and rehabilitation, costing over $400 million in construction. Mr. Tamannaie housed his staff in the City’s office to assemble HBRR application packages for this purpose and his work was used as a model by other City consultants to bring the number of applications to 100 submitted to Caltrans. The City was successful in its goal of securing the said HBRR funds for a great majority of the bridges in the program. The firm was also successful in securing additional funds through LACMTA, helping to create $400 million, multi-year rehabilitation program for the City. Mr. Tamannaie's subconsultant provided web site design services for the City to post program information, project data, citywide infrastructure data, consultant selection information and other City facts. Because of the quality of services, the firm's superior knowledge of the City's program and qualification of the team, the above efforts led to placing Mr. Tamannaie's team on top of the selection list for the next two selection rounds of the City's design projects. The firm was been given the responsibilities for planning and design of rehabilitation, seismic retrofit and widening of several major City bridges, including the historic Glendale-Hyperion Viaduct and the First Street Bridge. These efforts entailed not just bridge design but the entire gamut of project work including Caltrans Project Report, traffic analysis, environmental document, roadway geometrics design, mapping, landscape architecture design.